Learn how to make your own tote bag with our easy sewing pattern and tutorial. 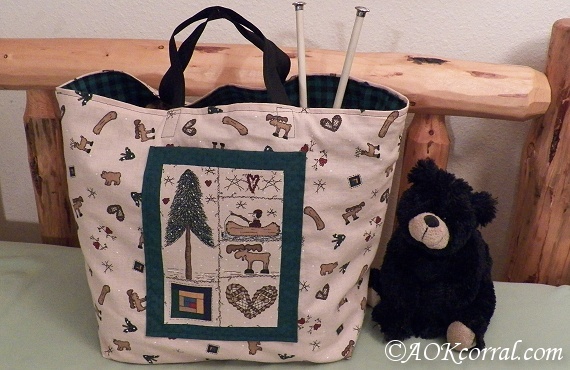 Great tote bag for ongoing craft projects or to use as a shopping bag. Uses: This bag is flexible making it great for storing and carrying projects like knitting, crocheting, quilting, and sewing. This bag also works great as a reusable grocery bag or shopping bag as the base is made to be the same size as a standard grocery store paper bag. Fold and press a hem of ½” on the top edge of the pocket. Fold 1” more on the top edge of the pocket and press again. Stitch the top hem into place close to the first folded edge. Fold and press a hem of ½” on the bottom edge and then each side edge of the pocket. Position the pocket on one of the tote bag body pieces as shown in the diagram. Pin into place. Stitch the pocket onto the tote bag, leaving the top open. 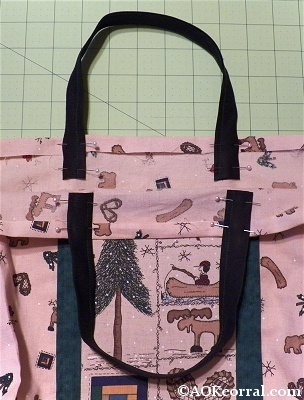 Pin the front and back of the tote bag right sides together and edges even. 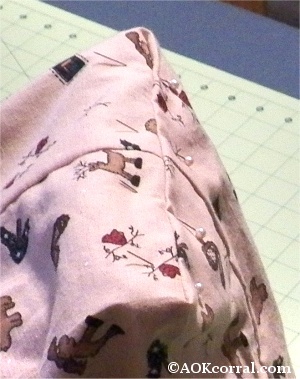 Stitch with ½” seam allowance around sides and bottom of bag. With a side seam facing up, place your hands into the bag and your fingers in the corner. Spread the fabric from the corner by moving your palms and arms apart slightly to form a triangle. 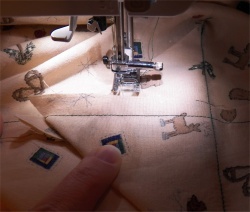 Lay the fabric bag down on your table without losing the triangle shape and with the side seam centered. Measure across the triangle to find the point where it is 7” from edge to edge and mark edges. Draw a line from one mark to the other. Measure the distance from the top of the triangle to your line. It should be approx. 3.5”. Repeat steps 3 through 7 again for the other side. 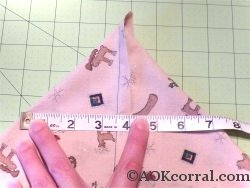 Stitch the triangle to the bag bottom with a seam line that is about 1 ½” to 2” from the tip of the triangle. Repeat the last two steps with the other side of the bag. Turn the bag right side out. Follow steps 1 through 10 for the bag liner as well. 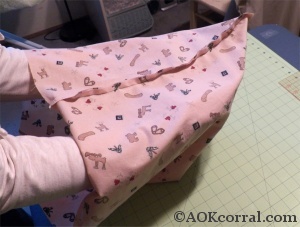 Press a ½” hem around the top edge of the tote bag. 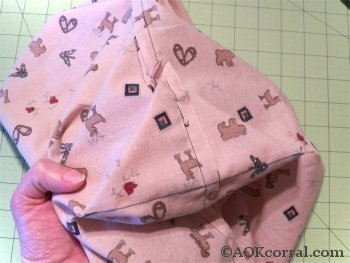 Press a ¾” hem around the top edge of the tote bag liner. Take one of the 15” handle strips and position the outside edge at 6.5” or just above the pocket edge. 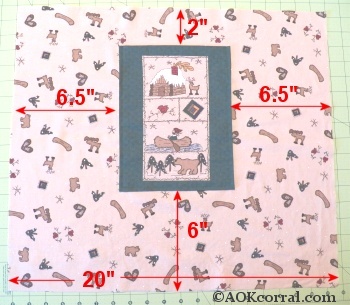 Adjust the strip so that the end is about 1 ½” is below the top hem edge. Pin in place. Before pinning the other end in place, see that your handle is not twisted and that the same edge that is facing out (toward the bag side) is also facing out on the other side. This will create a nice hold at the top of your handle. 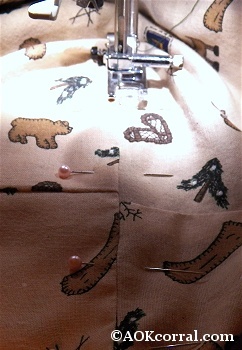 Position the end to 1 ½” from the top hem edge and pin into place. Repeat with all handle ends. Put liner into bag: Tote bag should be right side in, and liner should be right side out so that both wrong sides will be together. Shake the bag while holding the top edges to help the lining settle into position. Push the liner corners into the bag bottom corners to check for a good fit. Stitch the liner and bag together, close to the liner edge, all around the top of the bag. Put your hand into the bag at the side seam and push the liner corners into the bag corners again so they are together and also check that the bag seams joining the corners are also together. While your hand is still in the bag, use your other hand to place pins along the seam from one corner to the other, making sure to catch both the liner and the bag in the pins. Stitch the bag and liner together along the seam between the bottom corners being careful not to catch any other parts of the bag. Repeat these steps on the other side of the bag. or use it as a grocery or shopping bag.